New Mexico’s Santa Fe is our main base camp for all Southwest travels. For years, we have been exploring the ancient cities of the Anasazi throughout the Four Corners and beyond, after provisioning from the hilltop adobe hideaway overlooking both Santa Fe and Los Alamos. 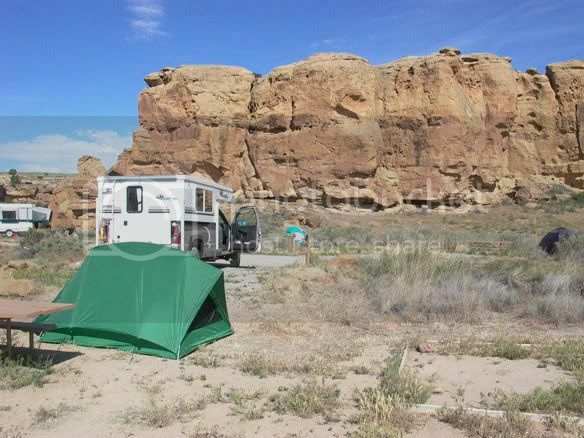 After our sub-zero nights during our Colorado Springs shakedown, our maiden voyage with our camper is set for the Chaco Culture National Historical Park. The weather has been abnormally cold for the end of May, we had to stockpile for cold and extreme heat, not knowing what we will be facing in the barren wind-swept high desert. 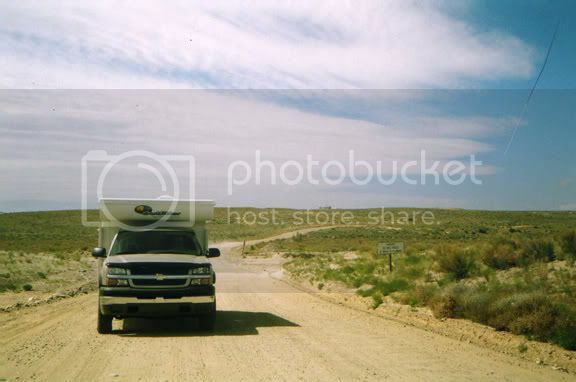 After a long washboard road, we finally make our camp in the high-desert landscape. Pitching a tent is needed to reserve our big emplacement while we go visit the ruins of the Anasazi, scattered among this immense valley. The park at 6200 feet elevation has extreme weather that can vary from 60 degrees in the same day. The wind today is already strong and clouds are moving in rapidly. We have parked facing the ancient ruins site at the campground. Our first hike brings us to Fajada Butte, the solstice marker. 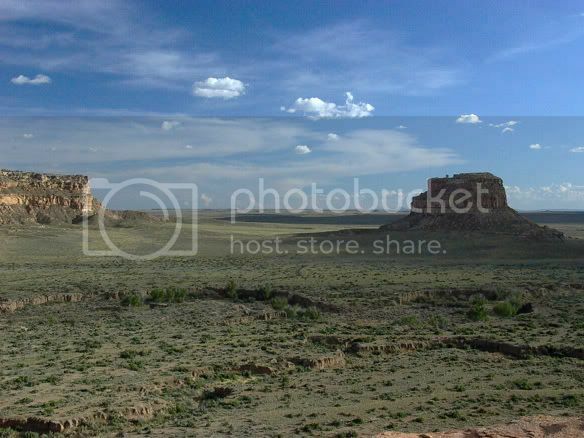 This dominant landmark in Chaco Canyon rises over three hundred feet from the valley floor. The immensity of the park permits great hiking with no crowds, allowing enjoyment of the desert calm and relaxed pace. The 2nd hike ends on top of the cliffs. 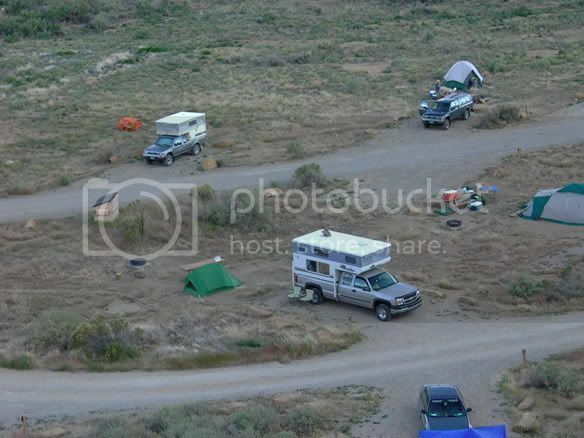 We have a great view of our camper and of fellow neighbor's truck camper that have set up close by. On the way down we will stop for a chat, anxious to meet the owner of this older Four Wheel camper. 40 miles from a major town, has no light and noise pollution. vehicles, are the only sounds we can hear. A disappointing evening without stars (no telescope we know of can cut through heavy cloud!) brought a cloudy night with gusty wind and even a small rainfall. 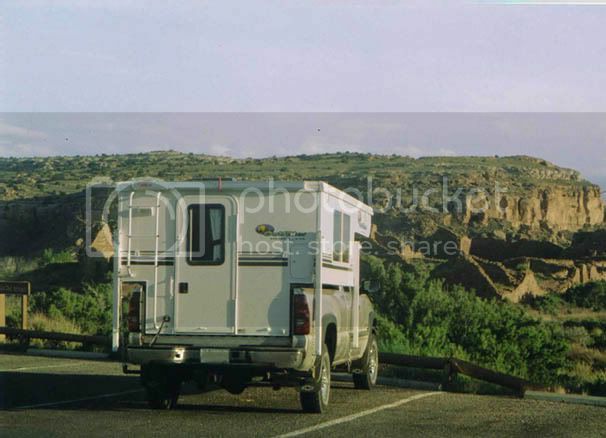 The next morning we head up with the Silverado and the camper to the only paved roads around Chaco. From the visitor center to the ancient city, the ruins structures are still standing majestically. Incredibly, though time has passed, you can still see remnants of the original mud mortar and plaster. 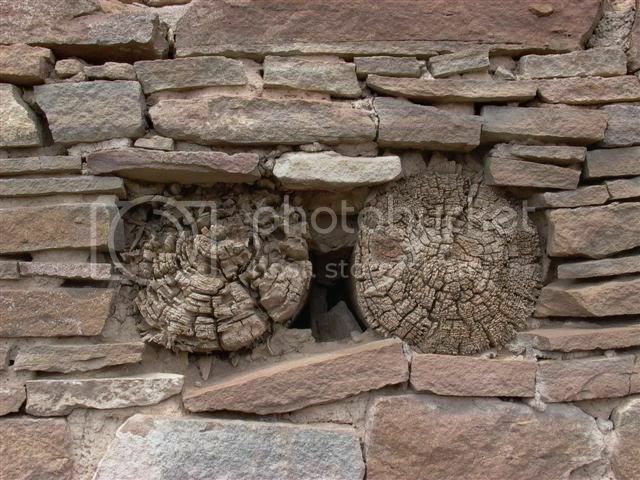 Anasazi roof construction of their housing structures utilized ponderosa pine or fir timbers. 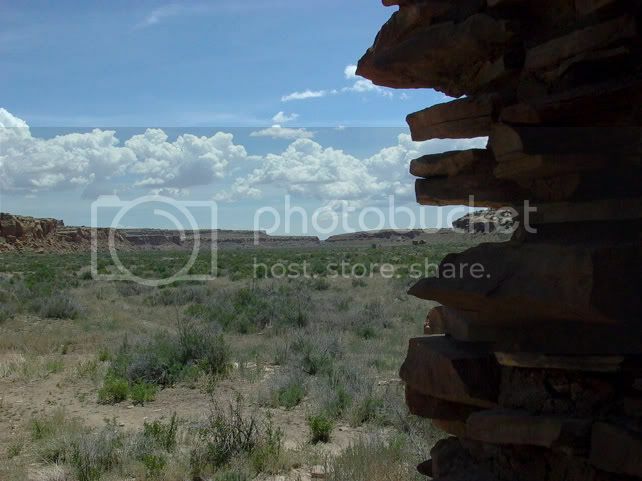 Some of these logs are still standing in the structures today. With dendrochronology (tree rings study) scientists are able to date the construction of this building at nearly one thousand years. The logs in the picture were use to separate the two stories of their houses. After a strenuous hike up the cliff, the view is majestic. The Pueblo del Arroyo displays the grandeur this city once had. Using a unique masonry, they have erected multiple storied dwellings, hundred of rooms, and build roads covering the entire region of North Eastern New Mexico. As we came back down from our cliff, the sun was setting, colouring the desert landscape with another palette. We were the last visitors before the closing of the trails. We headed back to our camp hoping for a clearer night. The night was still cloudy and we visited with our neighbors in their truck camper; they from Los Alamos. We shared topographic maps, books and brochures on the subject of the Anasazi and discussed Anasazi’s possible way of life at Chaco. The wind is again howling and sand is blowing in all directions, pelting our rigs. We tried to imagine the Ancients surviving in this harsh environment without the luxury of truck campers. 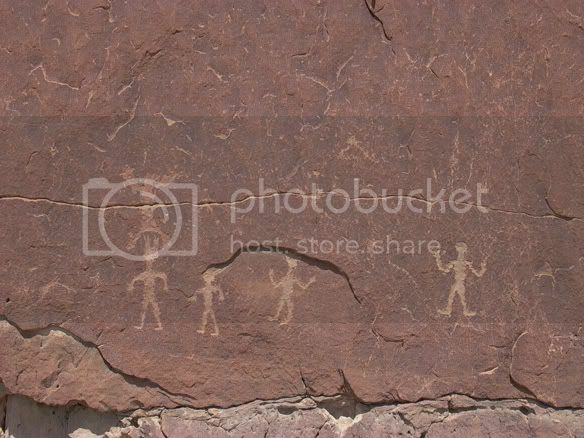 The next morning we are hiking on the trails of the petroglyphs. 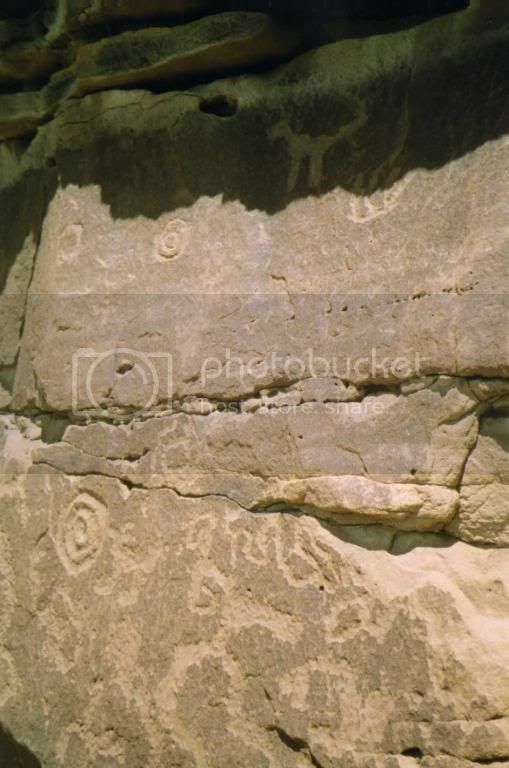 These drawings, pecked in the rocks, varied from the simplest child drawings, to the more complex sun dagger on Fajada Butte, said to have been strategically placed after 40-years of Ancient celestial observing and recording. From all our exploring in the Southwest, one of the major common themes in the Anasazi drawings is the spiral. Here again spirals are found. How many difficult trails and roads have we done only to capture a picture of a spiral or a special petroglyph never seen before. 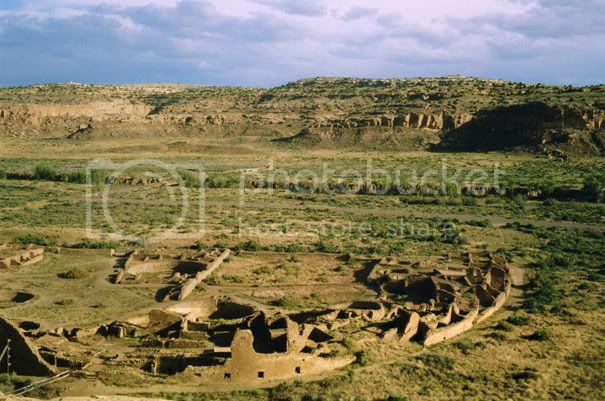 After nearly a week in Chaco, we hit, once again the washboard road, crossed the Chaco wash, and are looking for more ancient cities of the Anasazi to explore. This remote Park protects the ancient valley of Chaco, containing secrets from the diverse peoples that inhabited it. This park is an important place to each who visit, and for many reasons. It was simply magical for our maiden voyage with our Caribou. Next installment: From Moab to Soldier Creek mine, to the spectacular petroglyphs of Vernal, Utah. Once again another very well documented trip. Looks like a great time and throw in some learning. I need to get off the beaten path more. Love the camping life. 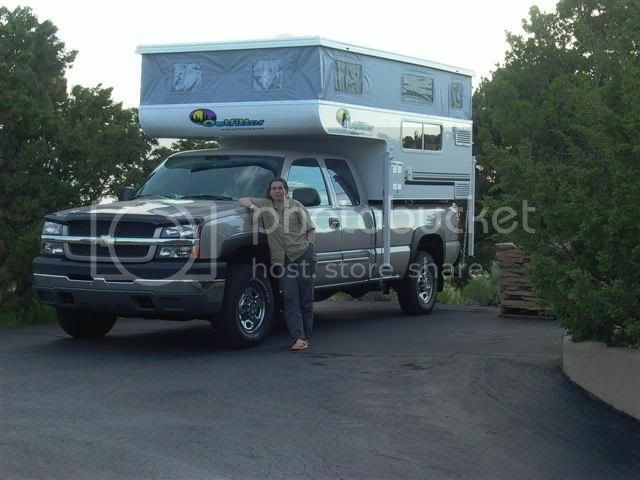 06 Host Rainier SS, 07 Classic GMC Sierra 3500 DRW. Thanks for the report, enjoyed it. Thank you for sharing it, and for the great description and photographs. Great report. 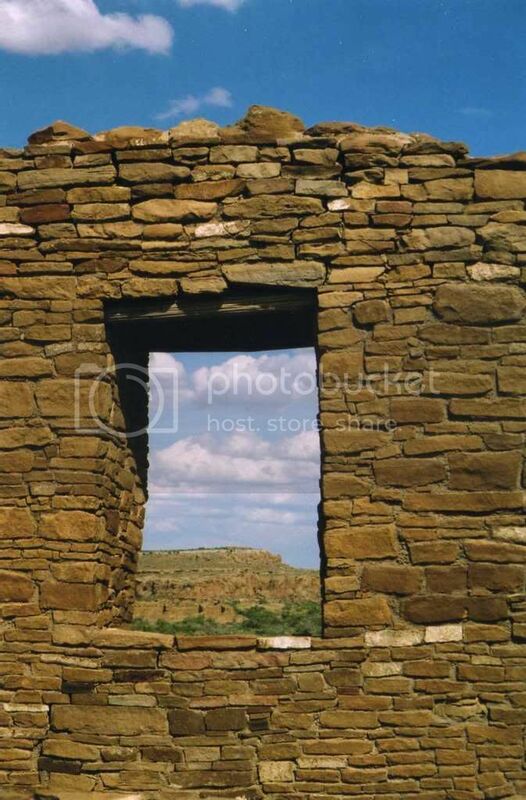 Am anxious to see Chaco Canyon. Have not been there yet. 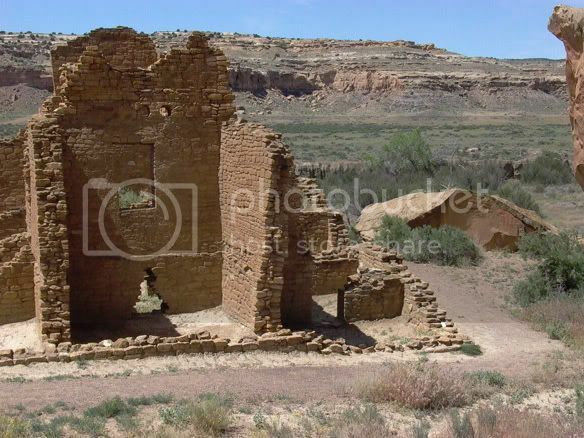 Have explored other Anazazi ruins in Arizona, Utah, and Colorado. It is awesome and intriguing to imagine their lives. Looking forward to your next report. Thanks for the well written report. Hey Silver, Wonderful pix and also great looking rig. Looks like you were blessed with good weather and a fun time. 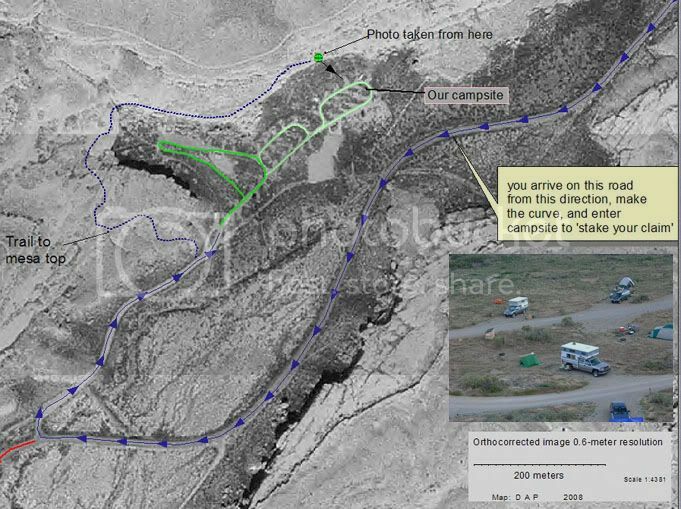 Surely that washboard road would have been worse without your smooth riding IFS front end. Thanks for putting up your pictures, I've always wanted to go there and now even more so. Great job - thanks for sharing the pictures. You brought back memories of our very brief visit to Chaco. We could have done so much more if I hadn't gotten sick!